I RECENTLY RECEIVED A GUESTBOOK ENTRY FROM FELLOW "TULIP TIME" LEAD BEVERLY COWELL DAPOLITO. BEVERLY WAS A CHARMING YOUNG LADY WHO PROBABLY DOESN'T REMEMBER HOW SHE AND I SANG A DUET ON STAGE AT HHS IN OUR SOPHOMORE YEAR. WE SANG A SONG CALLED, "THE THINGS WE DID LAST SUMMER." LOCAL SENIOR CITIZEN GUEST APPEARANCES). 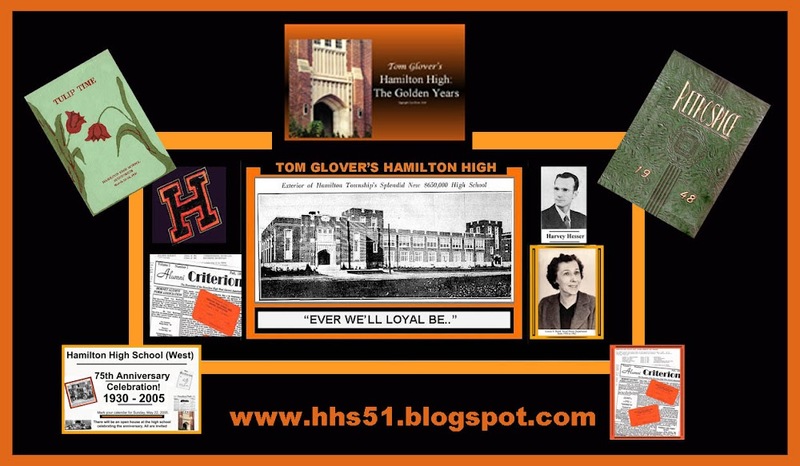 BEVERLY WAS ONE OF THE MANY HAMILTON HHS '51 YOUNG LADIES I REMEMBER TO THIS VERY DAY. BEV, IF YOU ARE READING THIS, AND IN FACT ANYONE WHO VISITS MY WEBSITE, PLEASE INCLUDE YOUR EMAIL ADDRESS SO THAT I CAN ACKNOWLDEGE YOUR VISIT. AND PLEASE COME BACK OFTEN!